In this step we will create an email alert to allow the Approver to review the document without needing access to SharePoint. For general instructions on the email alert, see the Alerts training article. This step uses the Infowise Smart Alert component. Recipients-Add the “Approver” column as the “To” for the alert. Now whoever is selected as the “Approver” will get the email for the alert. In the “From” field, enter or select the email address that the alert should be sent from. Since we will be having the approver "reply" to approve the email, you should enter the email address of the box that will be watched during the import stage. The example is using garrettc@Infowise.onmicrosoft.com. What To Send – We want the email to send when the author “submits” the document for review. In this example that action is that the author changes the status to “Review”. As such we will want to modify this setting to send when the item is either added or modified but only when the Status field changes to “Review”. This is done using the checkboxes as well as conditions as seen below. When To Send – The default settings are okay for this box as we want the email to send as soon as the user changes the status. 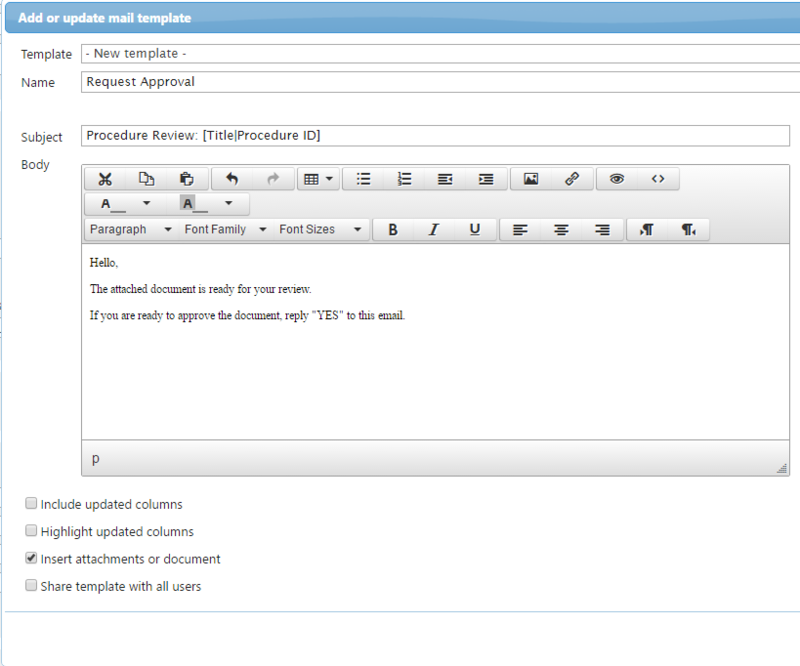 Mail Templates - Create a new template as shown, be sure to include the “Request ID” in the subject line as we will use that later to connect the returning email to the correct item. Also tell the recipient to reply “YES” if they approve the document. Set the new template to the “Item is added” and “Item is modified” slots. Advanced Settings – Leave these settings as the default.